Running is an effective way to lose or maintain body weight, bolster your cardiovascular fitness and give your legs an excellent workout. Because it is an intense form of exercise, you can expect a given level of soreness and fatigue in your quads, hamstrings and calves. For some runners, however, the legs go numb when they are running. This can result from either a gradual process or a sudden one and may be related to either a blood-flow issue or a neurological disturbance. The main muscles of the lower leg are the gastrocnemius and soleus muscles of the calf, which extend the foot at the ankle, and the tibialis anterior of the shin, which flexes the foot. The tibial nerve, a branch of the sciatic nerve, innervates all of these muscles. The blood supply to the calf comes from the posterior tibial artery, a branch of the popliteal artery that in turn originates above the knee from the femoral artery; the anterior tibial artery supplies the shin. Interruption of blood flow to your lower leg — peripheral vascular disease — can cause pain, tingling and numbness. 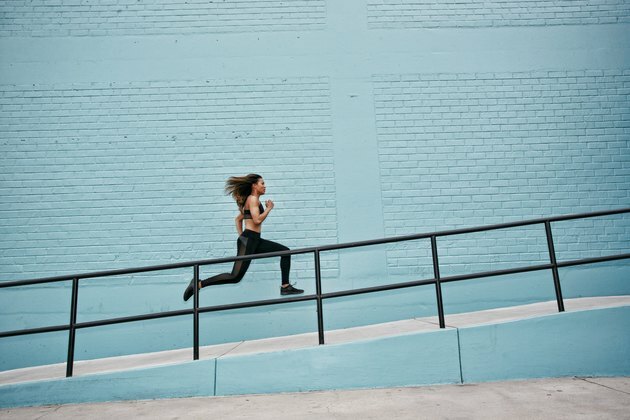 All of these occur more frequently and strongly while you are running because of the increased oxygen demands of the calf and shin muscles under such conditions. The immediate cause of the numbness is arteriosclerosis, or hardening of the arteries. Risk factors for arteriosclerosis include high blood pressure, high cholesterol, diabetes and other types of vascular disease. Keep in mind that you have to look after your overall circulatory health even if you run regularly . Numbness in your lower leg during running may result from pressure on a spinal nerve root or some other location away from the shin and calves. Another cause, however, is direct damage to the tibial nerve. This type of injury is called a neuropathy and is most often caused by a blow to the back of the knee or the upper calf. The tibial nerve can also be compressed in the tarsal tunnel, leading to numbness. It may also occur as a consequence of diabetes and other diseases that cause pathology across the whole nervous system. If the numbness does not go away on its own or comes back frequently, especially when pain is also present, seek medical help. The sciatic nerve is a long, high-diameter nerve that gives off branches to the skin and muscles in the front and back of your upper and lower legs. It courses from the lumbosacral spine through the buttocks muscles and down the thigh into the shin and calf, giving off various branches along the way. Sciatica refers not to a disease per se but to pain or numbness as a result of impingement of a muscle or other structure on the nerve, usually near its origin. It sometimes goes away on its own but you may need ice, physical therapy and steroid injections to get you back on the roads, track and trails. Lower leg numbness can also be caused by pinching of a nerve as it exits the spine — commonly referred to as spinal nerve compression. This condition in the low back, known as lumbar radiculopathy, can make legs go numb while running. While your symptoms might all be in your lower leg, this condition originates in the lumbar spine in your lower back. Read more: Why Are My Legs Tingling After My Run? Why Are My Legs Tingling After My Run? What Nerves Affect the Quad Muscle?